Saw it on the Thursday before official opening night here in L.A., and there were maybe 10 people in the theater? As a film and a document and an experience, I loved it. But I think it's one of those films, like Purple Rain, where it's best seen in a packed house with a legion of devotees. I wanted to experience the collective catharsis of joy and grief that was stirring in me, deeper down, while watching in the calm and restrained ambience of an ordinary cinema. 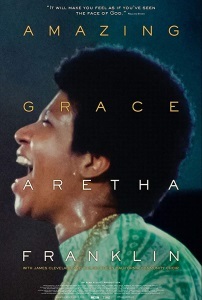 I'm also not entirely sure how to feel about it, considering Aretha resisted its release until the day she died, but as a purely selfish fan, I'm grateful for the experience. Saw it last night at EbertFest with a packed house in a very big theater. Lots of people clapping along and applauding after each song. I loved it despite the somewhat distracting technical issues with the visuals. There is nothing like seeing a great artist at her prime. I grew up with this album and it was almost overwhelming at times to see the performances fully embodied. The frustrating part? Not being able to sing along and stand up with the congregation. And who knew that one of the secret weapons in this production was a young man named Alexander Hamilton?